Style: Name Necklace/Letter Necklace Pendant Size: 1.5cm~4.5cm/0.59"~1.77" Hook: Double Hooks Chain .. Style: Carrie Name Necklace Pendant Size: 1.5cm~4.5cm/0.59"~1.77" Hook: Double Hooks Chain type: Cab.. It's sometimes hard to find a gift for girls – you want to find something that is fun but .. Style: Name Necklace/Letter Necklace Pendant Size: 3-4.5 cm(1.21"-1.8") Hook: Double Hooks Chain typ.. Please feel free to write your name in English, and we will translate it into Hebrew for you! Engrav..
We love name necklaces so much we created a name necklace where you can have more than one name on t..
Give a gift of love with this solid Sterling Silver name necklace embellishe..
Show that the person you love is right in your heart while wearing this stunning Personalised .. Style: Name Necklace/Love Necklace Pendant Size: 3-4.5 cm(1.21"-1.8") Hook: Double Hooks Material: 9.. Celebrate your name with this charming 18ct gold over Sterling Silver (0.925) necklace . Your .. Style: Name Necklace/Love Necklace Pendant Size: 3-4.5CM（1.2INCH-1.8INCH） Hook: Double Hooks Chain t.. Style: Carrie Name Necklace Thickness: 0.7mm/0.027" Pendant Size: 2.5cm/0.98" Hook: Double..
Adorn your personalised 18ct Gold over Sterling Silver (0.925) Carrie Style Name Necklac.. Style: Carrie Name Necklace Pendant Size: 3-4.5 cm(1.21"-1.8") Hook: Double Hooks Chain type: Cable .. Style: Name Necklace/Love Necklace Pendant Size: 3-4.5 cm(1.21"-1.8") Hook: Double Hooks Chain type:.. This personalised small “Carrie” style necklace is the perfect gift for fans of “S.. Style: Cross Name Necklace Thickness: 1.2mm/0.047" Pendant Size: 4cm*4.5cm(1.6"x1.8")..
personalise this Sterling Silver (0.925) stylish name necklace with any name you wish. T.. Celebrate your name with this charming solid 18ct gold name necklace . Your name will be writt.. Surprise your loved one with a personal gift. This classic 18ct gold over Sterling Silver (0.925) he..
Add a bit of bling to your personalised Sterling Silver “Carrie” Style Name Neckla.. If you love someone to infinity and beyond, the Sterling Silver Infinity Necklace with Initial..
Add a little fun to a normal initial necklace with the 18ct Yellow Gold Plated Sideways Initia.. Style: Name Necklace Thickness: 0.7mm/0.027" Pendant Size: 2.5cm ~3.0cm /0.98"~1.18" ..
Personalise this Bestseller with your own name and make a statement by adding the Swarovski cr.. Style: Monogram Necklace/Love Necklace Thickness: 0.7mm/0.027" Pendant Size: 20mm/0.787" H.. Style: Name Necklace/Letter Necklace Pendant Size: 1.5cm~4.5cm/0.59"~1.77" Hook: Double Ho.. Style: Name Necklace/Letter Necklace Thickness: 0.7mm/0.027" Pendant Size: 2.5cm ~3.0cm /0.98&q.. Style: Name Necklace/Love Necklace Thickness: 0.7mm/0.027" Pendant Size: 2.0cm~2.5cm/0.79".. Looking for a name necklace that is funky and fresh, chic and stylish? Why not show your name off wi..
We’ve taken our classic name necklace and added a bit of a twist to it with the Silver a.. Style: Love Necklace/Carrie Name Necklace Pendant Size: 3-4.5 cm(1.21"-1.8") Hook: Double .. Style: Love Necklace/Carrie Name Necklace Pendant Size: 1.5cm~4.5cm/0.59"~1.77" Hook: Doub..
personalise this lovely 18ct gold over Sterling Silver (0.925) "Coca Cola" font name neckl.. If you do not have a name you want to wear but a letter, either from your name or the name of someon..
Let flowers speak by personalising this fashionable name pendant with your own Name. Add a personal .. Style: Name Necklace/Love Necklace Pendant Size: 3-4.5 cm(1.21"-1.8") Hook: Double Hooks C.. Style: Name Necklace/Letter Necklace Pendant Size: 2.5cm ~3.0cm /0.98"~1.18" Hook: Double .. There is no better way to express your love than the "Love" Necklace in Sterling Sil.. Style: Name Necklace Pendant Size: 3-4.5 cm(1.21"-1.8") Hook: Double Hooks Chain type: Cable Chain M.. Style: Name Necklace/Love Necklace Thickness: 0.7mm/0.027" Pendant Size: 2.5cm/0.98" Hook:..
Personalise this delicate name pendant which is made especially small with the name of y.. Style: Name Necklace/Love Necklace Pendant Size: 2.5cm*2.3cm(1"*0.92") Hook: Single Hook C.. Style: Name Necklace/Letter Necklace Pendant Size: 3-4.5 cm(1.2-1.77") Hook: Single Hook Chain .. Style: Name Necklace/Love Necklace Thickness: 1.2mm/0.047" Pendant Size: 3-4.5 cm(1.2-1.77".. Celebrate your name with this charming double thick solid Sterling Silver (0.925) necklace. You..
personalise this delicate Angel Style name pendant which is made especially small with t.. This timeless favorite is a great way to wear your name. This design features handwriting style font..
We have a new and exciting bar necklace with name on it for you - the Gold Plated Nameplate Ne.. 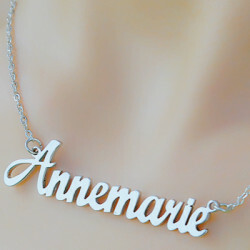 Wear your name in a fun, trendy way with our new Nameplate Necklace in Lowercase Font . Don.. Style: Name Necklace/Love Necklace Pendant Size: 3-4.5CM（0.6INCH-1.8INCH） Letter height :4MM(0.16INC..
Layered necklaces are extremely popular right now within all fashion circles and we created the perf.. Style: Name Necklace Pendant Size: 3*0.8CM(1.2*0.32") Hook: Double Hooks Chain type: Rolo Chain..
Personalise this Bestseller with your own name and make a statement by adding the Swarovski crystal .. Style: Love Necklace/Carrie Name Necklace Pendant Size: 2.5cm ~3.0cm /0.98"~1.18" Hook: Do.. This pendant is made out of 18ct Gold-Plated Sterling Silver (0.925) , and comes with an 18ct ..
Our Small Personalised Classic Name Necklace provides you with an opportunity to show off a little b.. Style: Monogram Necklace/Love Necklace Pendant Size: 1.5cm~4.5cm/0.59"~1.77" Hook: Single Hook Chain.. Style: Name Necklace/Letter Necklace Thickness: 1.2mm/0.047" Pendant Size: 3-4.5 cm(1.21"-..
Personalise your very own classic style Carrie name necklace in Rose Gold! The pendant is made out o.. Style: Carrie Name Necklace Pendant Size: 1.5cm~4.5cm/0.59"~1.77" Hook: Double Hooks Chain.. Item specifics: Style: Name Necklace/Love Necklace Thickness: 0.7mm/0.027" Pendant Size: 2.5cm .. This stylish Sterling Silver 0.925 necklace can be personalised with any name you choose.. Item specifics: Style: Name Necklace/Letter Necklace Pendant Size: 1.5cm~4.5cm/0.59"~1.77"..